This sci-fi movie is dedicated to our eternal struggle to reach and research, to conquer and obtain. It strives to reach for Kubrick’s “2001: A Space Odyssey”, but somewhere near the end of its run it lands below it. At the end of its 169-minute runtime one feels relieved that he has endured this emotional and transcending journey into space-time, gravity and physics. So much information and ideas float throughout this movie that we feel incomprehensibly lacking intelligence at some moments. That is because Mr. Nolan is giving us too much information in too short time. That being said – the film is incredible and beautiful. And even more – practically a direct message to our hearts that it is up to us to decide what to do – concentrate on saving our planet and our species or on what we do best – survive no matter what. The constellation of actors is incredible – McConaughey, Hathaway, Caine, Damon, Chastain, Affleck – we see almost the best cast which one director can assemble these years. And they play very well. The viewer can feel and succumb into their emotions – fear, despair, happiness, hope and so on. The camera perfectly follows the circular journey of our main character (conqueror) Coop’. The special effects and the music are GIGANTIC. Hans Zimmer is truly offering us the feel of depth and infinity. The drought and famine which are the problem of the future’s Earth are our problem right now too. Climatic changes are bringing us to the same problems which are presented in the movie as a certain reason of our species demise. That is why this film is so necessary at this point of our development as a modern society. That is why I liked very much the way Mr. Nolan has expressed his views in this movie. 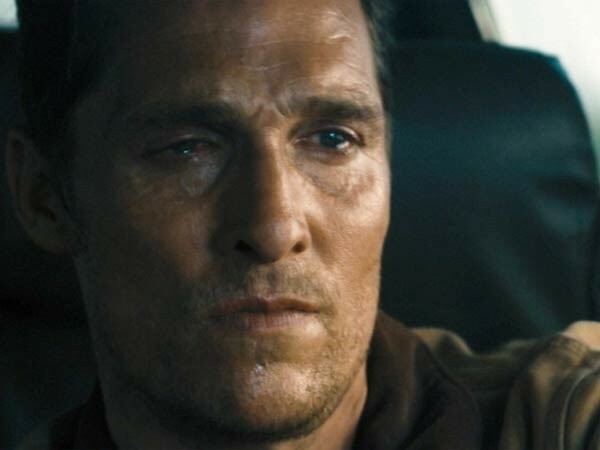 Also, please keep in mind that there are some VERY emotional and controversial scenes of confrontation between McConaughey and Hathaway, between McConaughey and Damon. There are some peaks of emotional strain which can offer you not only very good acting lessons, but also a perfect dissection of our human nature. This is what I liked best in this movie. And also – of course the topics about family relationships and love. It is very important that we always remember and understand that we as humans need to share with each other, to help and to remember each other. The the only gravity which transcends beyond time and connects us eternally is LOVE.